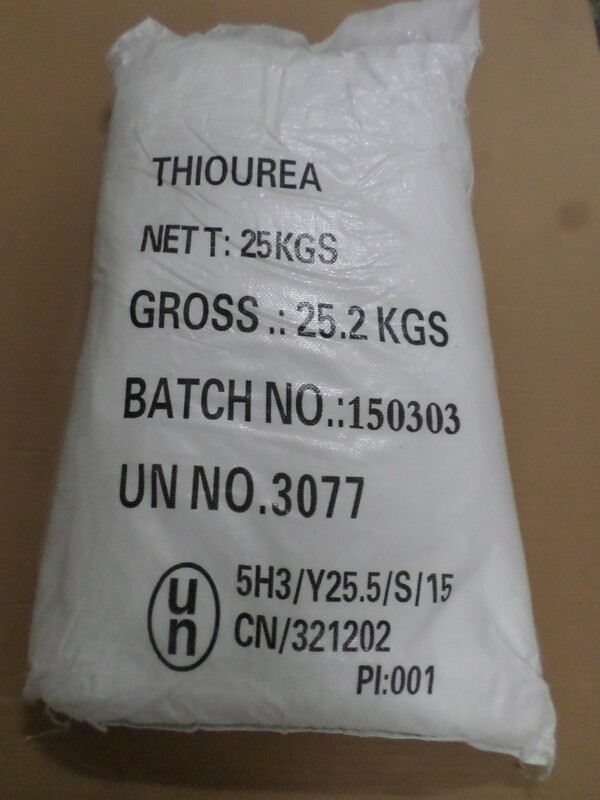 Thiourea is in stock. We are successfully exporting our thiourea world-wide. Thiocarbamide is an organosulfur compound with the formula SC(NH2)2 . It is structurally similar to urea, except that the oxygen atom is replaced by a sulfur atom, but the properties of urea and thiourea differ significantly. Thiourea is a colourless/white fine crystalline.The main application is in textile processing. Other industrial uses of thiourea include production of flame retardant resins, and vulcanization accelerators, used as an auxiliary agent in diazo paper, light-sensitive photocopy paper and almost all other types of copy paper. It is also used to tone silver-gelatin photographic prints. Our Thiourea has a minimum of 99 % (NH2)2CS with very low impurities. Gentrochema BV has a REACH pre-registration and we intend to submit a full registration in 2018. We can supply this substance from stock in the Netherlands. Minimum order quantity is 25 kg. It is standard available in 25 kg UN bags. Other packing is available on request. We can also supply a thiourea solution. Buy at Gentrochema chemical wholesale. Gentrochema is specialized in the trading of niche chemical products on a global scale. In order to buy chemicals you must be 18 years of age or older and registrated as a legal company. Gentrochema will NOT sell any chemical products to private persons.